If you had told me ten years ago that right now, there are TV series for The Flash, Arrow, SHIELD, Gotham, and Daredevil? I’d be absolutely giddy. Heck, on top of that, there’s a cornucopia of Avengers AND Justice League movies in the works. A Justice League movie! Something I’ve dreamed of all my life. Except…I couldn’t give two craps about anything WB has planned. I’ve mentioned that before. I’ve tried to get into Flash, Arrow, Agents of SHIELD, and Gotham. None of them have sustained my interest enough to keep watching. The thing is, I’m starting to feel like there’s too much comic book media coming out. Very soon, we’re going to start seeing two superhero movies from each studio every year. 2017 will have THREE Marvel movies: Guardians of the Galaxy 2, Spider-Man, and Thor 3, along with DC’s Wonder Woman and Justice League Part 1. 2018? Captain Marvel, Black Panther, Avengers: Infinity War Part 1, The Flash, and Aquaman. 2019? Inhumans, Infinity War Part 2, Shazam, and Justice League Part 2. That’s just the films. Then we have the TV shows. 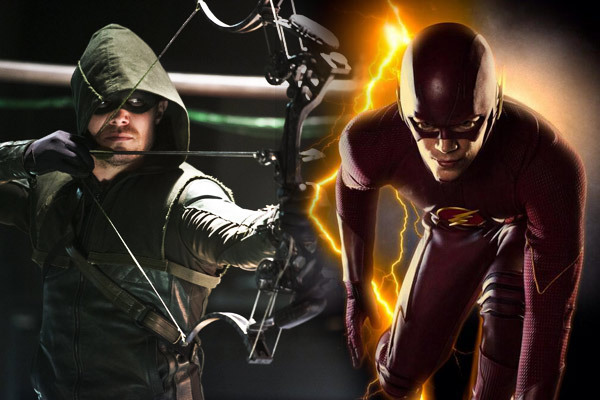 Assuming all goes well, we’re looking at Flash, Arrow, and their planned spin-offs, like Supergirl and Teen Titans. ABC will continue on with Agents of Shield and its spin-offs like Agent Carter and a possible Ms. Marvel series, along with The Defenders shows, adding another four to the roster. I don’t know about you, but I’m getting a little tired just looking at and writing about all of that. I’m looking forward to at least the Marvel side of things (minus SHIELD, which I gave up on after about six or seven episodes into the first season). And it’s all expected to be part of the same, shared universe? I don’t know, not only does it sound exhausting to think of watching all of that, but I don’t know if it’s even sustainable. With the shared universe, it’s starting to sound similar to the mess the comics are in: needing to buy several books just to follow along. So far, for the most part, each of the Marvel movies have been mostly self-contained where you can enjoy them on their own. There’s little need to watch all of them if you don’t want to. Even in Daredevil, Wilson Fisk’s entire motivation was because of the destruction caused to New York in The Avengers. Is it detrimental to the story if you haven’t seen The Avengers? Not at all. All you need to know is something caused massive destruction in New York and the city is in desperate need of rebuilding. Similar “something happened in New York” was mentioned in Iron Man 3 and Captain America 2. But can they sustain that? I’m excited for some of Marvel’s plans, but their plans on top of DC’s plans? And the talk of Valiant Comics signing with Sony to create a shared universe series of movies? Is it just me that’s starting to think it’s all starting to sound like overkill? Then again, if it all turns out as great as the Marvel movies and Daredevil, it’ll be hard to complain. This entry was posted in Comic Books, TV and tagged ABC, AKA Jessica Jones, Arrow, Daredevil, Gotham, Iron Fist, Luke Cage, Marvel, Netflix, The Avengers, The Defenders, TheFlash. Bookmark the permalink. I agree with you to a degree, Nick. All the studios are really starting to load up on movies, tv shows, and now streaming. I expect that the bubble will burst at some point, but I also think that the best stuff will stick around. For example, I’m enjoying Daredevil and Flash much more than Arrow. I’m three weeks behind on Arrow right now, and to be honest, I haven’t been as entertained by it this season. I see this like the comics: when you start reading a new title, you usually drop one you’re not enjoying so much to read it. Same with the tv shows and movies. I’m honestly not looking forward to the DC movies, so unless some get really good reviews, I probably just won’t go see them. I didn’t watch the Constantine show because I had no interest. Barring some great word of mouth, Teen Titans isn’t something I’m intending on watching either. Yes there is going to be a lot of content coming out in the upcoming years, but not all of it will be worth watching. The cream will rise to the top. I have an online friend – Starman Morrison – that manages to watch all the superhero stuff and write about it on a weekly basis. Guides for Flash and Arrow; and Constantine when it was still on. He’s always going on about great they all are, but I can’t imagine finding that much time to watch AND write about them. Though his live-Tweeting of Gotham (#GothamSnark) is hilarious. I gave AoS a second chance and binge watched the first season…and it paid off, bit time, the second one is really, really good. And there is one thing I can say about this show which none of the others can claim: It is never predictable. A lot of stuff which I expected to happen never came to pass. Instead it makes twist and turns which are still logical but I rarely see coming. Is Supergirl supposed to be part of the CW-verse? I thought it was supposed to be on a different network. DC is very confusing regarding which shows are connected to what. In any case, after going through the offerings I eventually ended up liking Marvel’s work more. Especially Agent Carter. Yeah, I keep thinking of maybe giving Agents of SHIELD a second chance. I don’t know. Those first 7 or 8 episodes were such a bore for me that I can’t see myself trying it again. I felt less interested in continuing on than I do about Arrow and Flash, which isn’t a good sign. I thought I’d read somewhere that Supergirl is part of the CW-verse. Maybe not, since it’s airing on a different network (CBS). I could be wrong in that example. And you’re right, it sure as hell is confusing. Especially when, unlike Marvel, the TV universe(s) is separate from their films. I dropped Arrow at the start of the third season. I get what you say about AoS…I agree, the first episodes were bad (though not as “stand-alone” as they initially seemed to be) and they actually dished out what I still consider the worst episode immediately before the show became good (Yes Men). Maybe you can start with the episode immediately after, though that would mean missing out huge chunks of the TAHITI subplot.